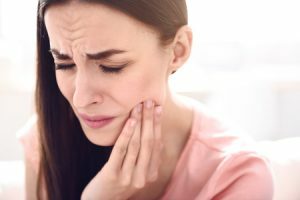 If you’re one of the 10 million Americans who suffer from jaw pain due to temporomandibular disorder (TMD, also known as TMJ), you might be wondering what to do to ease your pain. TMJ, often caused by unconscious jaw clenching or excessive gum chewing, leads to jaw, ear and neck pain, along with headaches, tenderness and discomfort when chewing. Sufferers know the pain can be unrelenting. You may have tried other tension-relieving techniques, but have you tried acupuncture? Acupuncture relieves jaw pain by restoring the flow of energy, known as chi in traditional Chinese medicine. If you prefer modern scientific terms, it reduces pain through direct nerve stimulation. To treat jaw pain, your acupuncturist will insert needles around the ear and jaw, and possibly other areas as well including the big toe, elbows and knees. Evidence suggests that acupuncture is an effective way to treat jaw pain caused by TMJ. According to one study, 84 percent of patients said that their pain got better after just one acupuncture visit, compared to 87 percent who reported no improvement at all after receiving NSAID pain relievers. If you’re concerned about needles, don’t be! Most people only feel a tiny prick from acupuncture needles. It’s likely you’ll experience no pain at all. If you’re in the Los Angeles area and suffering from jaw pain, check out WellStream Acupuncture. Call us today at 323-463-9355 to find out how acupuncture can help you!